When our sense of self-worth becomes overly dependent on external validation, we are drawn to rescue others prematurely and to neglect basic parts of our lives before they are on solid ground. If you are a giver, you will seek to help others before time almost compulsively for what would seem to be a myriad of good reasons: to satisfy the hunger for connection, to feel appreciated, or to gain a sense of purpose. Reaching out too early may also be a way to avoid our own issues or, alternatively, we may hope that those we assist will in time reciprocate our help. 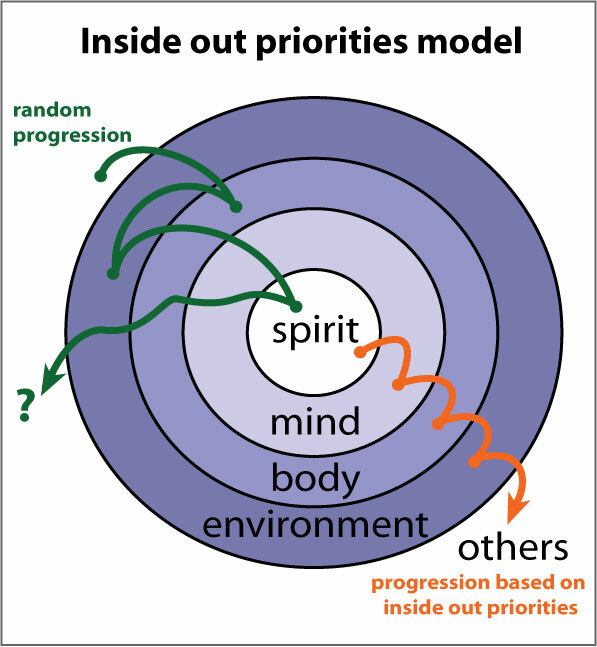 Because I have not always had the full energy level most people have, I developed a decision making tool called "Inside out priorities" that helps me to answers the question "what should I do next?". After all, the less energy you have the more intelligently you need to use it. The system is easy to understand and serves well individuals experiencing illness or physical difficulties, so imagine what it can do for a completely healthy person. The main tenant of the model is that your own affairs need to be in order before you engage, coach, or assist others. This may sound easy, however, you will find that it is exceedingly tempting to start resolving the problems of others before you have dealt with your own first. Conserves energy: Keeps you focused on one life area at a time and prevents energy loss from task switching. Saves time: It allows quick decision making; hesitation is gone. Accomplishes the important: Work that you define as significant is completed and allowances are made for emergencies. Is widely applicable: The model is applicable to your home life, work environment, and different life phases. Self-sustains the user: You operate from a state of wellbeing. Resiliency is fostered, burn-out is prevented. What does inside out look like? Imagine that your environment and you are represented by a series of concentric rings with the most inner circle, the bull's eye, representing your core, your essence. We will call this center ring "spirit". If spirit sounds too esoteric to you, think of it as a strong sense of purpose. Moving out from spirit we find the rings of mind, body, environment, and others. Inside out priorities means that you take care of the inner rings first, and only after you have addressed these areas do you start working on the next more external ring. Note the orderly in-to-out progression represented by the orange line in the accompanying diagram. Dedicating time to work on your life from the inside out requires discipline like saying no or later to those you care about or feel indebted to. Even when you choose to focus first on your own affairs, you may find yourself reactively jumping from one unrelated task to the next (see erratic zig-zag green line in diagram) without realizing that there is a better way to organize your day, dare I say your life. To make things clear as we go along, I will explain how you can apply the model to a simple everyday situation, such as your weekday morning routine, and get more out of it. Can you remember the moment you chose to start living? No, you can't. You just woke up one day, perhaps in a hospital, all damp-haired and squinty-eyed and crawled up somebody's chest (hopefully your mother's) to latch on to a breast. The main choice you are really making as an adult is to continue living. Even though you may not be sure what the reason is, you know that there are some things you need to accomplish before you leave this place in peace. I am not talking about simple subsistence, avoiding pain, or experiencing one more pleasure. I am talking about the deep sense of satisfaction that comes from knowing that you have in the words of Robin Sharma, lived wisely, loved well, and served greatly. Example: Right after you wake up your eyes are open and you are staring at the ceiling. The 1-2 minutes before you get up is an excellent time to reconnect with your sense of purpose. For example, if you tow cars, you can say to yourself "Today I will use my great sense of organization and empathy to make sure that stranded motorist get the help they need". This sense of mission will make it easy to get up and to feel energized. If it does not, it's time to go to bed earlier... or change mission of course. My perspective is that we use our mind, but we are not our mind, and that just like our body, the mind is a device subservient to our spirit/purpose. When you see your mind as a tool rather than an intrinsic part of your identity, it becomes easier to understand how, just like a stack of papers or a garden, it can become disorganized and needs tending. Be vigilant of your thoughts and like a patient gardener diligently pluck away the mental weeds that waste energy, for example: judging others, entertaining fear-driven thoughts, focusing on unlikely negative outcomes, allowing intrusive repetitive thoughts of little value, or concerning yourself with events that you cannot impact. Is your mind incessantly repeating the tune from a commercial jingle? Shut the tune off. Are you still thinking about your coworker's opinion regarding the clothes you wore? Let it go. Has somebody else's lifestyle met with your disapproval? Move on. Do you feel powerless about the civil war in a distant country? Ignore it. By taking these steps you will silence useless mental chatter and create the space necessary to populate your mind with uplifting and positive thoughts of your choosing. Example: In the morning we do a lot of thinking while we perform mindless tasks that do not require our full focus. So when showering, brushing your teeth, or making your bed, any time your mind thinks unproductive thoughts redirect it towards positive thinking. For example, ask yourself in what small way will you contribute today towards your purpose? What steps will you take? What resources will you need? Anticipate the emotional high you will feel at the end of the day after making a unique contribution. After the spirit and the mind comes the body and all body-related matters must be in order. This life area includes proper hygiene and grooming, having clean clothes to wear, nutrition, adequate sleep, exercise, entertainment, and down time. You may say, but this is so basic! It is, and it's also overlooked by many who later crash and burn because their bodies were neglected. These are the people honking in traffic, grumpy at work, and who experience minor things as obstacles. Even when you have a good mental attitude, willpower supported by a healthy vibrant body can do much more than willpower held hostage in an under/overfed, tired, or sick body. Example: As soon as you are up and about, tune in to your body as it will begin to speak to you. What is it saying it needs? It's telling you "help me to wake up", so you jump in the shower. It tells you "I am hungry", so you fix it a nice breakfast. Oh, and clip away that bothersome hanging nail you have been ignoring. While catering to your body resist the lure of unrelated tasks like checking your email first thing in the morning or taking out the trash because it is an eye sore. Right now you are tending to your body. The degree of order and beauty that surrounds you, a concept known as entropy, will affect your mood and how productive and effective you can be. Clutter, disarray, misplaced or dirty objects will work against you in the time of need and can also be mildly depressing. Clean, organized, and methodically arranged tools and information instead are a pleasure to view and are the structure you lean on when you are flooded by multiple requests or are facing tight deadlines. It takes time to maintain order, but you can do it at your leisure and then reap the rewards when the pressure to perform is on. Example: When time is limited, most people first tidy up the areas that are visible to guests such as living rooms, or with the potential of embarrassment if left unattended, such as bathrooms. In the morning, do the exact opposite and start cleaning your own bedroom and making your bed. Next clean and restock your kitchen. Both these rooms restore your energy by facilitating proper sleep and proper nutrition respectively. Completely tidy up one room, close the door, and move to the next. Administrative tasks like online banking, filing papers away, and processing correspondence are other ways for you to care for your environment. If you have been following the model, by now you have built a solid and sustainable foundation from which to reach out and help others. But so many need help, so who should you help first? Using logic consistent with the inside-out approach, help those that are immediately around you first, your own family, friends, clients, and community. Refrain from donating to charities, sending funds for causes abroad, or volunteering until your own life, family, and local community are well. If you are still not sure who to help, consult with your spirit. Example: Cook or bake something nice and take it to the office to share, learn something new so that you can show or teach others, memorize a funny joke and tell all those you know, write an encouraging message to someone who needs it, or leave your home with time to spare and let others go in front of you during your commute or when shopping. Find ways to inject some love into the world. Start simple, then expand outwards. Urgent matters may require you to digress from the orderly progression of the model. After all, if there were a leak under your sink, you would not go do a 30 minute meditation on the spiritual meaning of your life. You would call the plumber. So any matters that have an imminent deadline and an important positive or negative consequence are addressed out of sequence. This could include making your next mortgage payments, keeping a promise you made to a loved one, returning a job interview call, writing down something you may forget, or asking somebody you are attracted to for their phone number before the party is over. When you ask people what their passion or mission in life is, you will find that it is invariably connected to others. The artist creates beauty so that others may appreciate it, the engineer designs a better telecommunication device for others to stay in touch, the researcher synthesizes a new anti-inflammatory drug to reduce the arthritic pain of others. Purpose cannot exist independent of others; they are inextricably linked. This means that the more correct graphical representation of the model is of a 3-dimensional doughnut or inner tube. 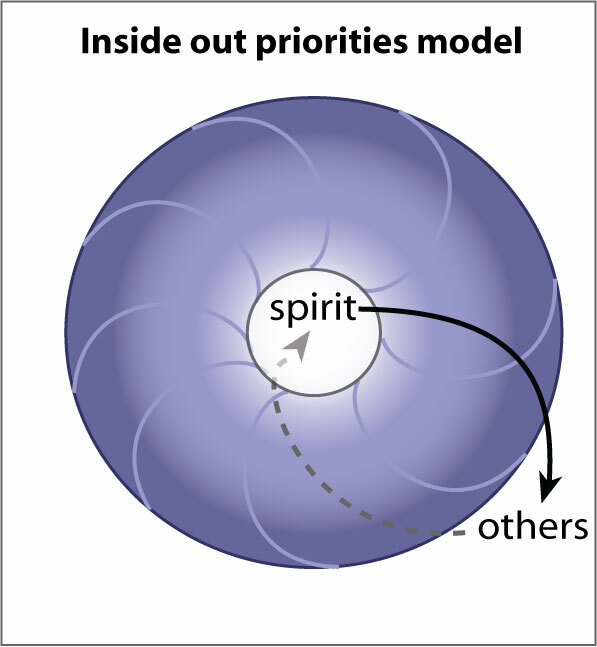 Your spirit resides in the hollow center and is immaterial, so it does not depend on anything physical. It is directly connected with the spirit of others; yet, to interact with other beings and assist them in a sustainable and practical way, you need to traverse and care for all the physical rings in between: mind, body, and environment. The model was applied in this article to a home environment. What would happen if you applied it to a day on the job. What would you do differently? What new result or effect would you expect to see?